The rehabilitation movement that emerged as a result of casualty management in World War II had a direct bearing on professional interest and organization of care for children with cerebral palsy. Prior to the 1940s there was little organized interest in CP care with a few exceptions such as the multi-disciplinary clinic at Children's Hospital in Boston under the neurologist Bronson Crothers, and the rehabilitation center in Reisterstown Maryland organized by orthopedist Winthrop Phelps. 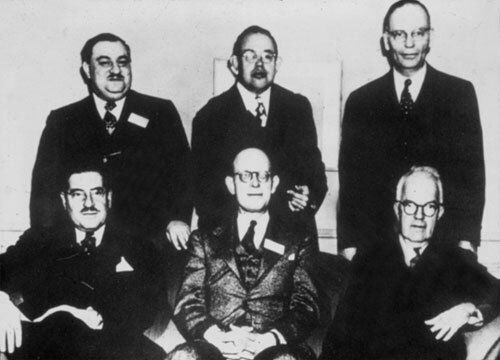 These Council members met on several occasions and in 1947 in Chicago founded the American Academy for Cerebral Palsy (AACP) as a professional organization devoted to inter-disciplinary physician education. Winthrop Phelps was elected as the first President. The Academy has since met annually in alternating locations across the United States and Canada with the exception of two meetings in 1950 and only a skeleton assembly on Sept. 11, 2001. The Diamond Jubilee meeting was held in Boston in Sept. 2006 during which some 700 attendees participated in a gala dinner celebration. Initially membership in the Academy was composed of Fellows who were required to be board certified physicians. Others were classified as guests. Over the years membership has subsequently been made open to all who have appropriate background, training, and experience in the field relevant to care of individuals with disabilities. Current membership exceeds 1000. During the 1950s Developmental Medicine and Child Neurology ("the Red Journal") became the official journal of the Academy. It is printed in England and by 2007 will be distributed in North America by Blackwell Publishing. By the 1970s the scope of the Academy had greatly broadened its interest in dealing with all of the disabilities associated with cerebral palsy, as well as the full range of other developmental disorders. Accordingly, the name was expanded to American Academy for Cerebral Palsy and Developmental Medicine (AACPDM) to reflect this wider interest and activity. An International Affairs Committee was added in 1986. This has opened up membership and participation throughout the world. Scholarships are now available for attendance at the Annual Meeting. Also, close liaison and mutual exchange is increasing with similar associations such as the European Association for Childhood Disability and AusACPDM. The AACPDM web site (www.aacpdm.org) has been steadily building since 1996. In addition to courses for members, the online Newsletter, and membership information, it includes recommended reading lists for both parents and professionals. In 2006, the AACPDM moved its administrative headquarters from Illinois to Executive Director, Inc., located at: 555 East Wells Street, Suite 1100, Milwaukee, WI 53202; Phone: 414-918-3014; Fax 414-276-2146. The Executive Director is Tracy Burr. Scherzer A, Ed. Early Diagnosis and Interventional Therapy in Cerebral Palsy: An Interdisciplinary Age Focused Approach to Infant Developmental Problems. 3rd ed. Revised and Expanded. Volume 11, Pediatric Habilitation Series, New York: Marcel Dekker, 2001, p. 10.